‘Spondy’ is spine and ‘arthritis’ is swelling or inflammation of joints. In this article I will explain a group of joint ailments that cause immense pain and suffering. Out of a variety of joint diseases affecting the bones of the spine, spondyloarthritis affects younger patients. It is different from the usual mechanical backache. The harmful nature of this condition becomes evident after a few years when the bones of the spine-termed vertebrae- show irreversible damage. If this disease is detected and treated early, significant disability can be avoided. There are many segments of bone called the vertebrae that get together to form the spine. These vertebrae should have the ability to move between one another for us to bend and twist properly. Especially the neck bones (cervical spine) and the bones in the lower back (lumbar spine) move at remarkable degrees for us to perform certain tasks. Imagine a gymnast who should bend at extreme angles to perform her routine or a professional diver plunging into a pool while rotating at great speed. Why do these vertebrae not dislodge from one another when we bend? Thanks to very strong bands of elastic named ligaments none of the spinal bones will separate. Ligaments are the cello tapes of the human body. With their rubbery nature, ligaments allow some degree of movement for the spine to bend and rotate while preventing us from overdoing certain movements. What happens if the ligaments become bony like? Then the stretching ability of these bands will be lost and the spine won’t move at all. Simply this is what happens in spondyloarthritis. These are ankylosing spondylitis, psoriatic arthritis, reactive arthritis, inflammatory bowel disease associated spondyloarthritis and enthesitis related arthritis. Ankylosing spondylitis affects the spine, especially the lower part, and results in a bamboo spine. This is the term given to a spine that has fused bones with appearance in X ray resembling a bamboo. Psoriatic arthritis is seen in patients who already have psoriasis or develop psoriasis later on. Reactive arthritis is where the joint disease develops after an infection, as a reaction. Patients who have inflammatory bowel diseases, like ulcerative colitis and crohn’s disease, can develop spondyloarthritis as well. When areas such as the back of the ankle ( Achilles tendon) or bottom of the heel ( plantar fascia ) are swollen, it is termed enthesitis. This can occur with spondyloarthritis as well. 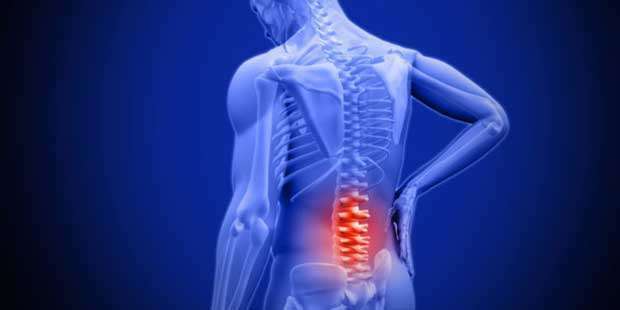 Both pain and stiffness of the spine which worsen in the morning and get better as the day progresses is typical of spondyloarthritis. Some patients experience deep pain within the buttocks. This happens when sacro-iliac joints are swollen. Sacro-iliac joints are found within the muscles in the buttock and when inflamed/swollen cause early morning pain in the buttocks. This pain can be experienced on one side of the buttocks as well. The neck, which is the upper part of the spine, can get affected during spondyloarthritis. Early morning stiffness of the neck, which reduces the ability to look up and down and turn the head to the side, is also a common feature. Together with the spine involvement most patients recall joint swelling in other regions as well. Swelling in the knees, ankles or even joints of your hand might be symptoms relating to spondyloarthritis. Sometimes an entire toe or finger can get swollen resembling a sausage. This is called dactylitis or a sausage digit. Most patients who develop psoriatic spondyloarthritis have very mild or absent skin psoriasis initially. Psoriasis might not be noted especially when the rash is found behind the ears, around the belly button, beneath the breasts and over the back of the neck. Pain and swelling behind the ankle or at the bottom of the heel (enthesitis) is an associated symptom of spondyloarthritis. Rarely are red painful eyes and blurred vision (uveitis ) features of this ailment. The patients might have a relation who has been affected by similar symptoms (A positive family history). The detailed history of the symptoms is of paramount importance. Then the joint disease consultant will do an examination of the affected regions. The range of movement of the spine in bending forward, backwards, sideways will be assessed. Any other swollen/inflamed joints will be checked as well. Certain blood tests like ESR, full blood count, kidney and liver functions are important for us to initiate medicine. X rays are very useful to identify any damage to the spine or joints. Sometimes we order MRI scans of the spine or sacroiliac joints. These scans are very useful to detect early changes that are not mature enough to be detected by the X rays. A genetic test called HLA-B27 is done in certain instances. This test is positive in a few normal healthy individuals as well. But positive detection of HLA-B27 supports spondyloarthritis in people who have symptoms of the condition. What are the available modes of treatment for spondyloarthritis? I would like to divide the treatment into two categories. We could use medication to control the disease or else we recommend using remedies like physiotherapy to keep the joints healthy. In most instances both these categories of treatment are required. Medication is centred around NSAIDS ( Non steroid anti-inflammatory drugs) and disease modifying drugs. Some of the common NSAIDS used are naproxen and cox 2 inhibitors. Out of the disease modifying drugs, Methotrexate and Sulfasalazine are frequently used. The doses and the frequency of these medications are decided by the consultant depending on the findings of the investigation. What the medication does is control the disease, so that permanent spine/ joint damage does not occur. This is because changes in the bones are usually irreversible. If the spondyloarthritis is severe we tend to use drugs called biologics. These comprise a group of highly sophisticated medications which targets certain molecules within the body. Biologics block inflammation/ swelling of joints and therefore control the disease. The emerging problem with biologics is their cost. Together with medicine the mobility of the spine / joint is encouraged. This is achieved through physiotherapy and occupational therapy. Stretching out the already immobile spine through therapy will aid the recovery process. Western medicine treatment for spondyloarthritis is growing by leaps and bounds. The traditional era of using oils and applicants is now historical. Early and correct treatment will help the patients to lead a near normal lifestyle.